Through her work to honor Korean War veterans, Hannah Kim has left an imprint on Washington D.C. and the United States. 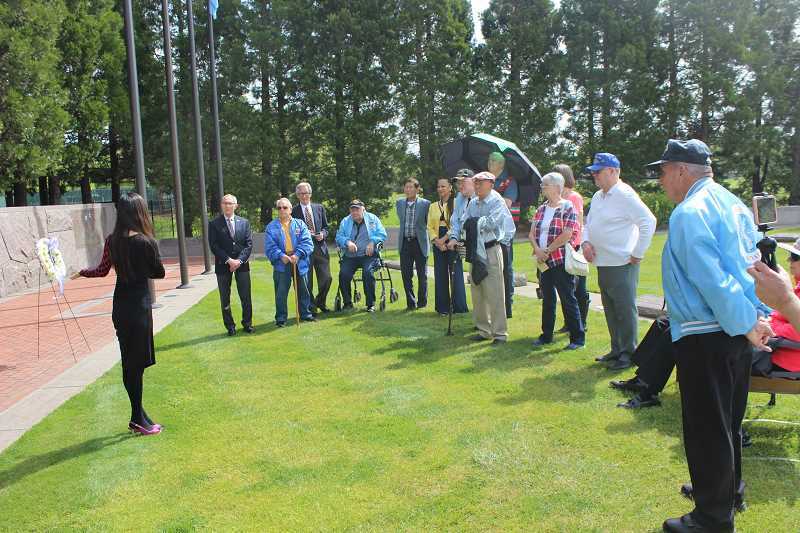 And as one sliver of her latest mission to further honor veterans of the war and their families, she traveled to Wilsonville's Korean War Memorial for a commemorative ceremony Saturday, May 5. There, she extolled the valor of soldiers who fought in the war and promoted peace along the Korean Peninsula. But, most concretely, the trip to Wilsonville and Korean War memorials in all 50 states is part of an effort to ensure that a Wall of Remembrance at the Korean War Memorial in Washington D.C. will receive funding. The bill greenlighting the Wall of Remembrance, which would include engraved names of soldiers who died in the war, passed through Congress in 2016 but has not been funded. It is designated for funding via private donations. Kim hopes her trip will inspire people to donate money to the wall and that the press will help disseminate her message. "Honestly there's only the veterans and me and some elderly Koreans (who attended the Wilsonville ceremony). We're already stakeholders. We're here because we already care and we already know," she said. "I'm hoping the rest of them will read about this and say 'Wow, what is this Wall of Remembrance?' And maybe be inspired to do something about it." As a 24-year-old graduate school student, Kim established the "Remember 727" organization dedicated to raising awareness about the Korean War. And in 2009, she successfully lobbied Congress to pass a bill establishing July 27 as National Korean War Veterans Armistice Day. Soon after, she worked as U.S. Rep. Charlie Rangel's communications director and chief of staff. Rangel also sponsored the bill to build the Wall of Remembrance. When Rangel retired in 2017, Kim decided to embark on a world tour, where she talked with Korean War veterans and promoted awareness for what some call "the Forgotten War." And when she learned that the Wall of Remembrance had not received funding, she decided to undertake a United States tour. Wilsonville was the fifth stop in her United States tour, which will end on July 27 in Washington D.C.
"The reason why I'm going individually even to the smallest cities, it's because I want to remind people that it (the impact of the war) was in your own backyard," Kim said. Though North Korea and South Korea agreed to an armistice in 1953, the Korean War hasn't officially ended since a peace treaty hasn't been signed. However, South Korea President Moon Jae-in and North Korean Supreme Leader Kim Jong Un recently declared a commitment to ending the war. During her recent travels, Kim said she's sensed elevated excitement among veterans that they can finally attain closure. "I'm hoping that is something that will lead to lasting peace so these veterans feel 'I did well,'" Kim said. Kim said Wilsonville's memorial is more comprehensive and educational than most. The memorial includes names of Oregonians who died in the war and plaques of important names and dates from the war. "I've visited memorials around the world and I've never seen one quite like this," she said. The Wall of Remembrance would include the names of the 36,574 Americans, South Korean soldiers who served in U.S. units and United Nations soldiers who lost their lives during the war. "I'm in awe of what you're doing and as I frequently say one of the pleasant surprises is the amount of attention that has been payed to us primarily by the Korean Americans," President of the Korean War Veterans Association Oregon Chapter Bob Cassidy said to Kim during the ceremony. "Nobody paid any attention to us when we came home after the war." To donate to the Wall of Rememberence, visit http://www.koreanwarvetsmemorial.org/wall-of-remembrance/.